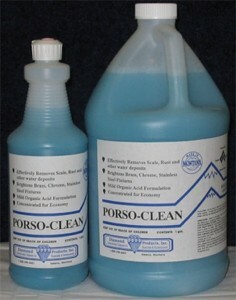 Porcelain cleaner that is mild but effective. It is a non-fuming acid cleaner formulated for the quick, safe cleaning of lime and other residues on shower walls, ceramic tile floors, and similar surfaces. Safer than and much preferred to harsh bowl cleaners and other mineral acid products. Free-rinsing, light-green liquid with pleasant characteristic scent.